A human friend joins us today in the Troll Woods. Invited for companionship. he repays with a mushroom hunter’s knowledge. Born in America of Sicilian immigrants, he brings an enthusiast’s excitement to the gathering of wild food. We hadn’t started on a mushroom hunt but rather a morning walk under the newly appeared sun. Water backed up from a growing beaver dam flooded our chosen trail to force us into the Troll Woods where he discovers a Porcini mushroom (Boletus edulis) standing above the mossy ground. Nearby we find tipped over Porcini look a likes that have gills that mark them as a different genus. Another hunter passed this way before us to grab the choicest mushrooms. With a strong morning sun muscling its way to the forest floor I decide to take my friend home over a trackless section of the woods. We can’t get lost as long as we keep the sun in our faces. 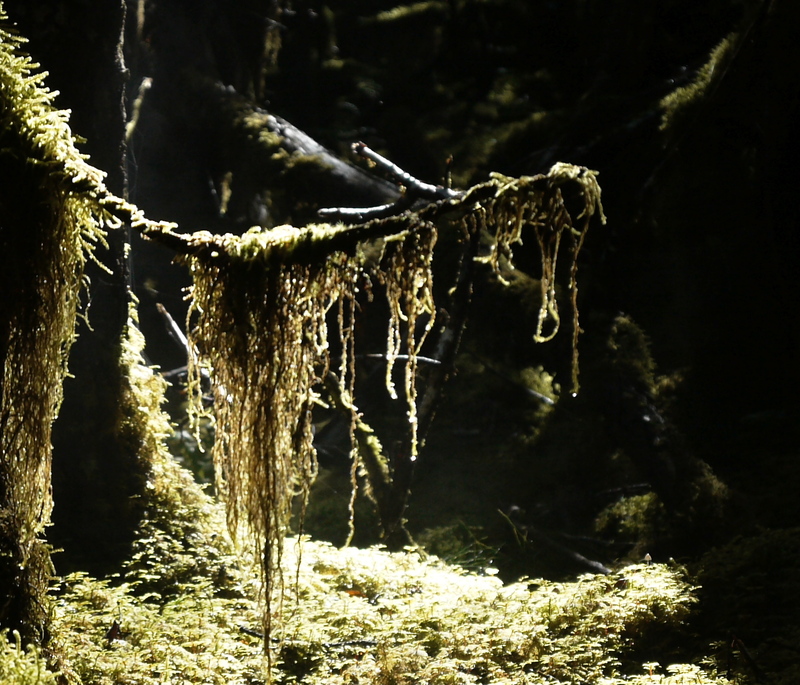 We move slowly over the soft moss covered ground, sometimes following faint deer trails or the heavy worn paths made by beavers. Other times its a ballet over and around tree trunks and branches. Aki stays with the mushroom hunter to show him the way when I move out of his sight. A gentleman, he thanks her each time. It’s a slow, peace bringing task to follow the sun through these thick woods. We pass an indentation in the moss still steaming from the heat of the deer that just left it. This brings stories from my friend of other hikes and shared kayak trips. An hour and more passes without notice until we regain the man made trail. 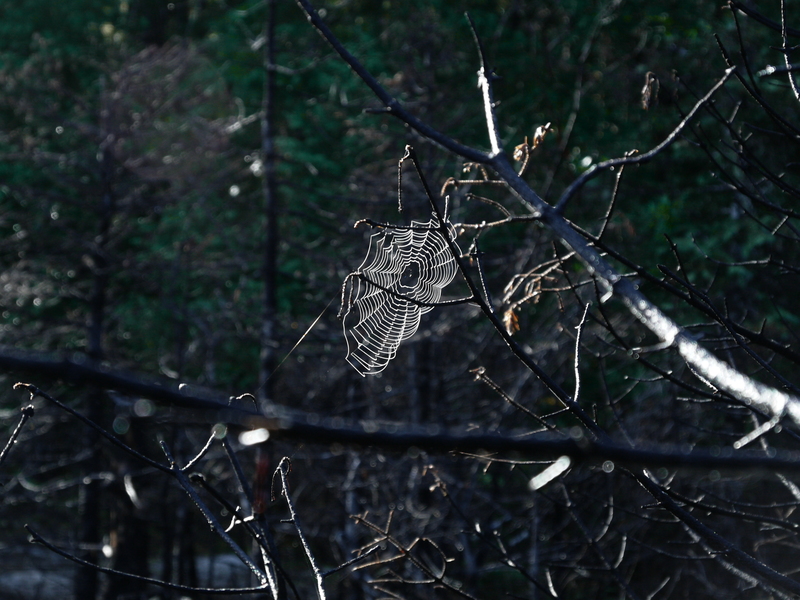 It takes us to a burned area where a spider web of sinister beauty, backlit by the climbing sun, is the sole decoration in a fire blackened alder tree. Nearby two huge Russula mushrooms, encouraged by the warming sun, push skyward. One wears a mossy cap. 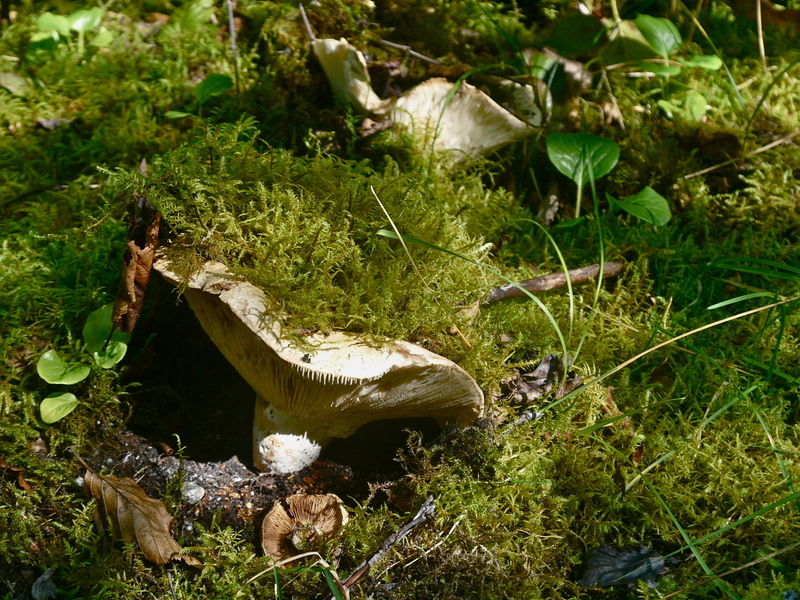 Here we also find more Boletus mushrooms — enough for a lunch— and gather them up. Arriving at my friend’s home, we examine our find and discover blue dots forming in the mushroom flesh. They aren’t the delectable Porcini after all but a cousin not worth cooking. He shrugs and delivers a salad rich in fresh greens, olives and tomatoes. Tall bottles of oil and vinegar arrive next along with chunks of hard Italian cheese and a thin dried salami. Then he brings us thick brown hard bread. I smile for now there is no room on the table or stomachs for mushrooms. 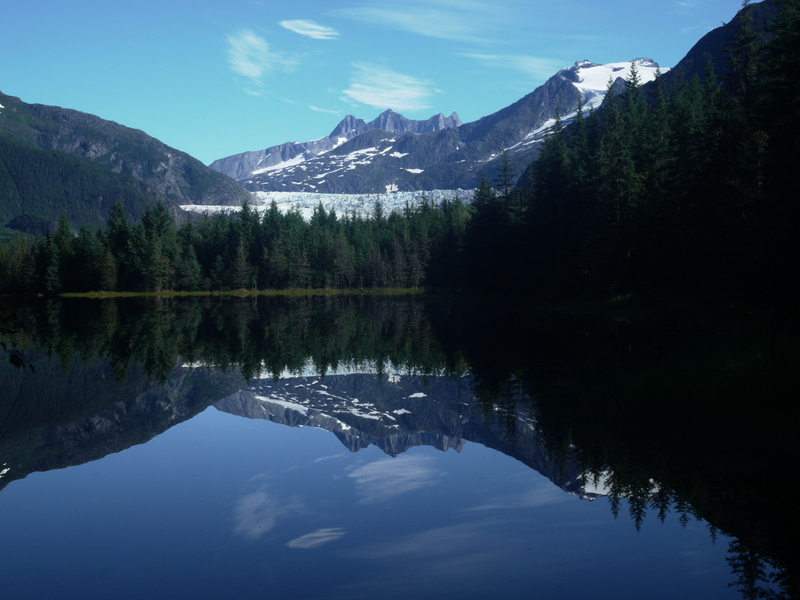 This entry was posted in Aki, Beavers, Dan Branch, glacier moraine, Juneau, Kwethluk, Nature, Southeast Alaska on August 29, 2012 by Dan Branch. The smell of death dominates this forest walk. That’s how it is along this river at the end of the salmon spawn. Just there, through that patch of river side spruce trees lie the rotting bodies of dog salmon as well as the gulls, ravens and eagles that feast on them. Aki goes on alert when we hear a splash following by a new chorus of gull complaints—- all signs of a bear working the river shallows for late arriving salmon. We stay to the forest today not wanting a repeat of last year where Aki chased a fishing black bear up a tree and then into the forest. 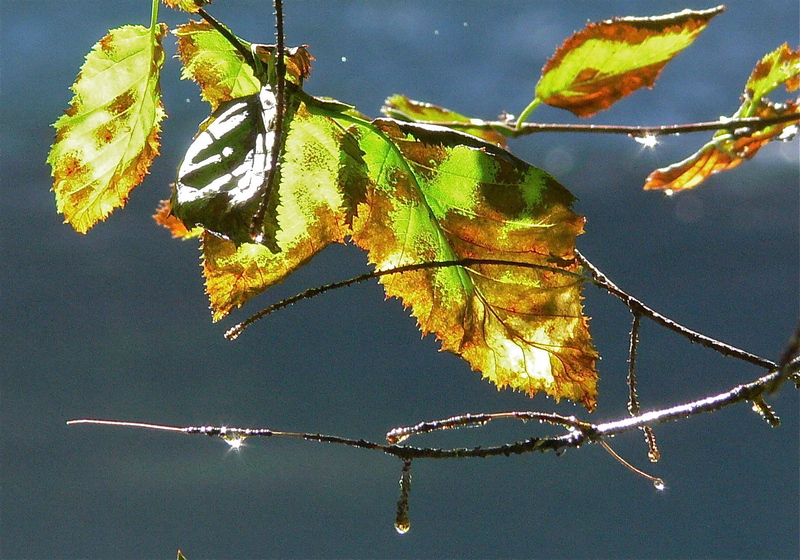 This morning the grey rain of late August gave way to sun, which now backlights tree moss and understory foliage. 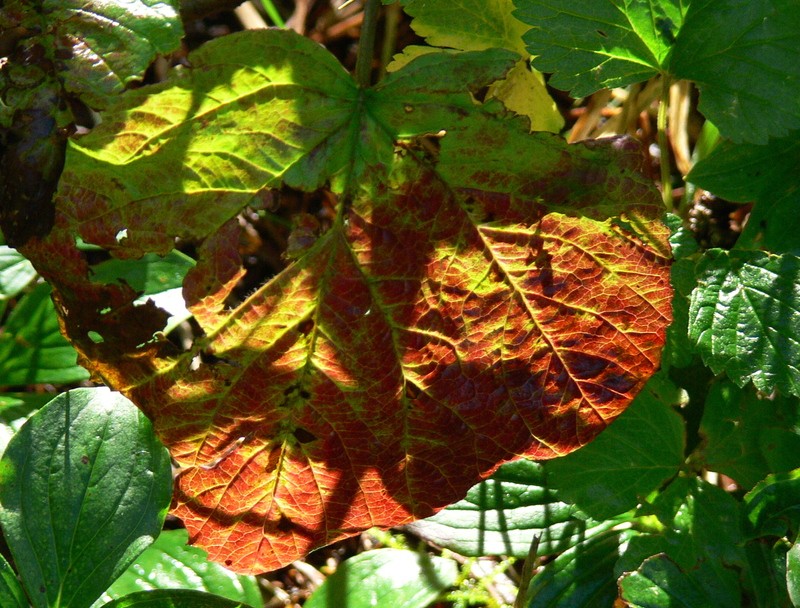 While green dominates the forest my eye is drawn to the rare patches of reds and yellows produced by dying leaves. Leaving the usual trail we turn to an area of the forest where the Nagoonberry grows. A legend in the berry picker’s world, the segments of this dark red fruit are said to exceed all other berries in flavor. I’ve tried in past summers to taste one but someone always manages to hoover them all up before I can find a ripe one. Today I pick two and find them too tart and without must after taste. Even this Highbush Cranberry, yet to be brought to peak flavor by a heavy frost, tastes better. While the forest opens up to reveal a mountain of true beauty I puzzle on the worth of the common blueberry and the rare Nagoon. The Nagoonberry, like gold and diamonds, is made valuable by its relative scarcity and the willing belief of the consumer. The blueberry just tastes good. 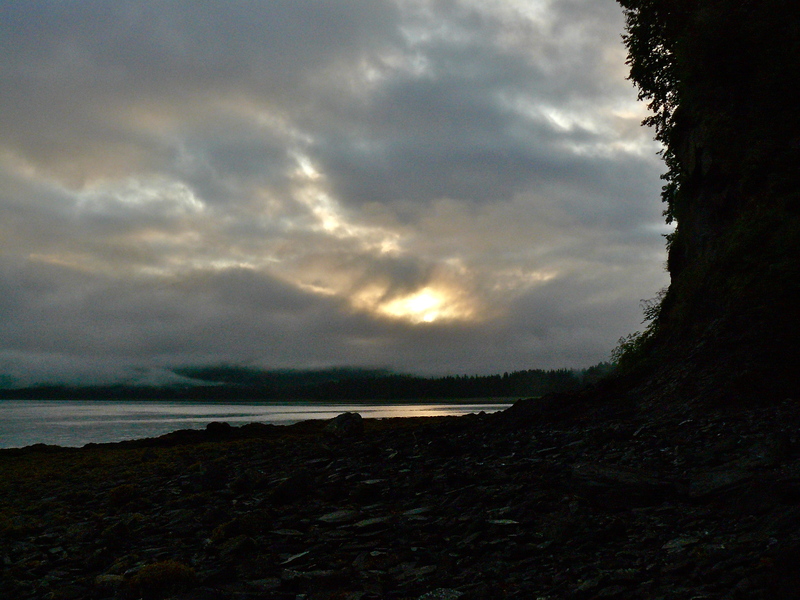 This entry was posted in Aki, Dan Branch, Juneau, Kwethluk, Nature, Southeast Alaska on August 26, 2012 by Dan Branch. This morning a heavy fog blocks our view. Sunrise begins its demise. Drinking morning coffee on the cabin deck the Captain and I are just able to make out the yearling brown bear fishing at the salmon stream mouth. Two of his elders, both making him look tiny, stir from makeshift beds in the stream side meadow and walk sluggishly into the woods. A small cloud of gulls forms around the young one, which at this early hour, annoys him. After a few half hearted attempts at grabbing a salmon he passes down the beach in front of the cabin and disappears into the fog. Today we take the portage from Port Frederick to Tenakee Inlet. A friend ran into three habituated brown bears at the portage when he made this trip last May. It was only with great effort that he and his two companions were able to keep the bears away from their food laden kayaks. 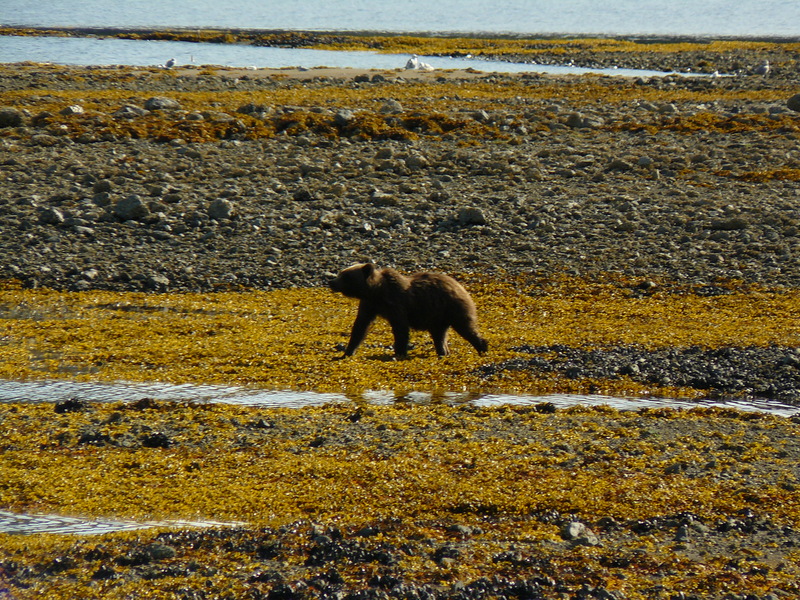 In May bears spend much time grazing on beach grass at places like the portage. Little should keep them there this late into the salmon spawn. On this hope we push aside fear, pack the kayak and leave for the portage an hour before high tide. It takes a 14 to 15 foot high tide in order to paddle all the way to the actual portage trail. Today we will only have 11 feet and expect to spend a long time moving the kayak and gear just to get to the trail. In full sun we wind our way through a serpentine channel at the foot of Port Frederick. It leads us to a narrow tidal stream now too shallow to float the kayak with us in it. We line the boat for a few more minutes until it goes completely aground in the stream far from the portage. The stream braids into three channels. The Captain and I explore each until settling on one leading into a small pond. At its head a rough trail, marked with a metal diamond, leads into the woods. We unload the boat and I start carrying the food and gear along a bear trail stomped into the muddy grass lining the pond. 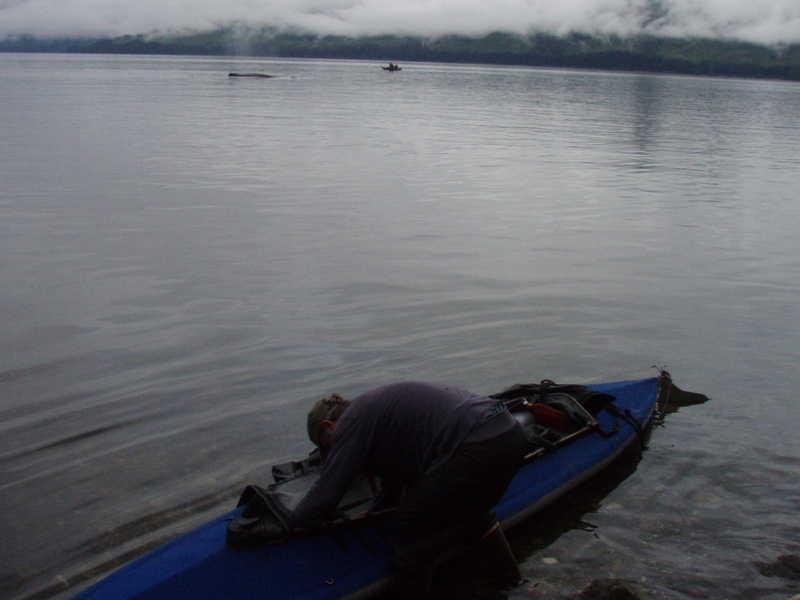 While I make multiple trips from gear pile to trail head the Captain lines the kayak, its keel dragging in foul smelling black mud until he reaches the head of the pond. We pass through a section of blue berry bushes still laden with water from last night’s fog. This means no bears have recently passed this way. In minutes the trail crests and we see through the woods a green meadow rather than the sparkle of salt water. Pushing on we reach the meadow and walk across it to where a small stream enters another mud bottom pond. In a few days, when the high tide would crest at over 16 feet we could have easily paddled up the stream and across the pond to the actual portage trail. We are both tired but aware that the more time spent making the portage the greater chance of an uncomfortable encounter with bears. I hang the food in a nearby spruce tree and find that it is surrounded by tall yellow cedars. Their pretty majesty can’t delay our efforts so I grab some dry bags and hike with the Captain up the trail calling out a gentle warning to any bears that might be ahead. They hate nothing more than being surprised. After dropping our load at the pond’s edge we start back for more, passing holes recently dug by bears hungary for the rice like roots of Chocolate Lilly plants. Hurrying on we make the several trips necessary to move the kayak and other gear to the pond, which is not deep enough to float us and the gear. The captain again has to line the boat along the pond shore while I use a paddle to keep it from grounding in the muddy pond side grass. It’s been three hours now since the kayak went aground and we still have to move gear, food and boat over another land portage to Tenakee Inlet. The trail is short but muddy and in 90 minutes we are eating a delayed lunch along side a mountain lined fjord. Across the inlet we spot an island with a small stream nearby. We paddle to it with plans to make it our camp. Tall tree covered domes rise from the inlet. To our right we can look into an intriguing wet land at the head of the inlet. 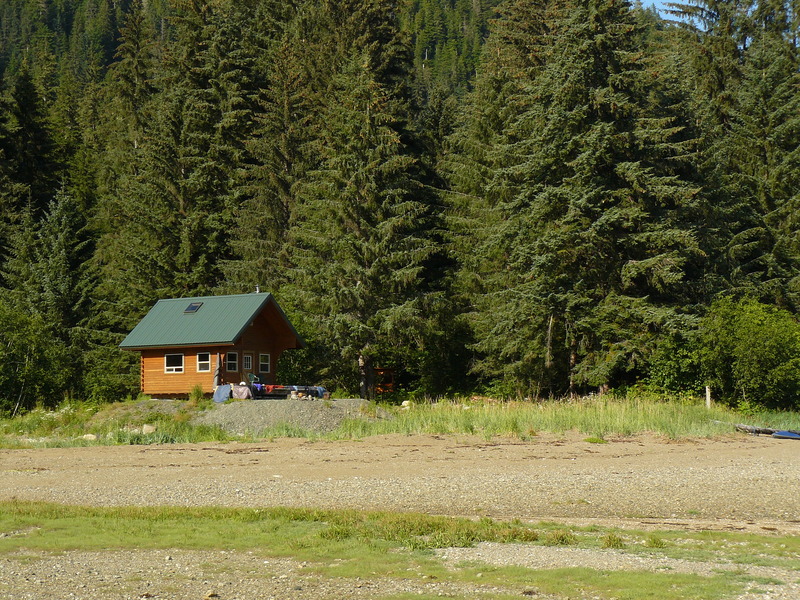 Tomorrow, if the good weather continues we will explore it before starting the paddle up Inlet to the Tenakee Springs ferry terminal. 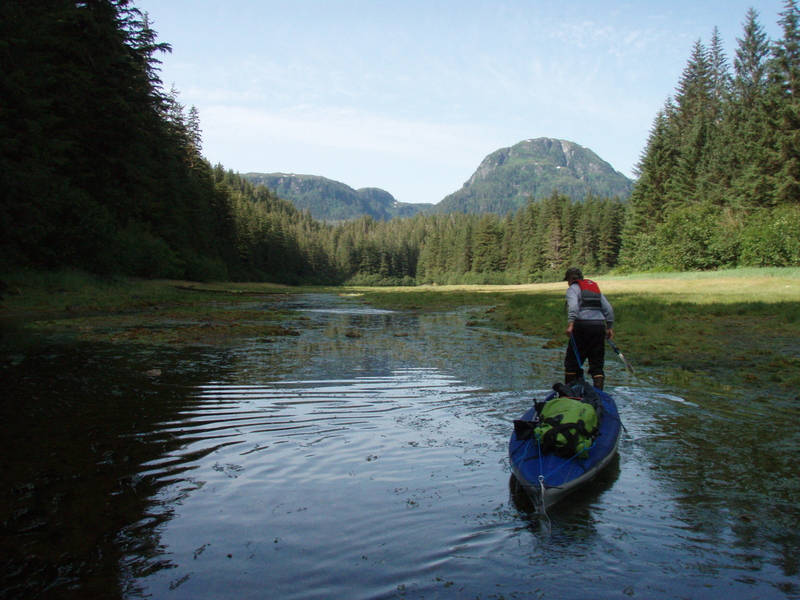 This entry was posted in Brown Bears, Dan Branch, Juneau, Kayak, Kwethluk, Nature, Southeast Alaska on August 25, 2012 by Dan Branch. The paddle to Chimney Rock takes up up Port Frederick toward Necka Bay. The wind builds as we travel to produce small waves. They present no problem until we approach the spit marking the passage into Necka Bay. We land to survey the passage around the spit, calling out in confident tones to any bear that might be sleeping in the tall grass bordering the beach. When none rises to our voices we hop out of the kayak and find recent bear sign. The sun breaks out from the clouds to make the beach a warm and inviting place. The captains finds a sunny hollow at the point lined with more Bluebells of Scotland. From here he raises a couple of bars on his cell phone and makes a last call home. There will be no more cell coverage until the ferry ride from Tenakee Springs to Juneau. While he calls I watch a fat black and yellow bumble bee climb in and out of the flower bells, completely disappearing on each foray into the flower. After making a quick sketch of Chimney Rock I join the captain in a survey of the passage into Necka Bay. We could make it in but would have a hard time on the return trip. Then an ebbing tide would be working against the wind to build a nasty little sea. It would be worse at the exposed spit. Saving the bay for the next trip we paddle down Port Frederick to the Forest Service cabin at Eight Fathom Bight. 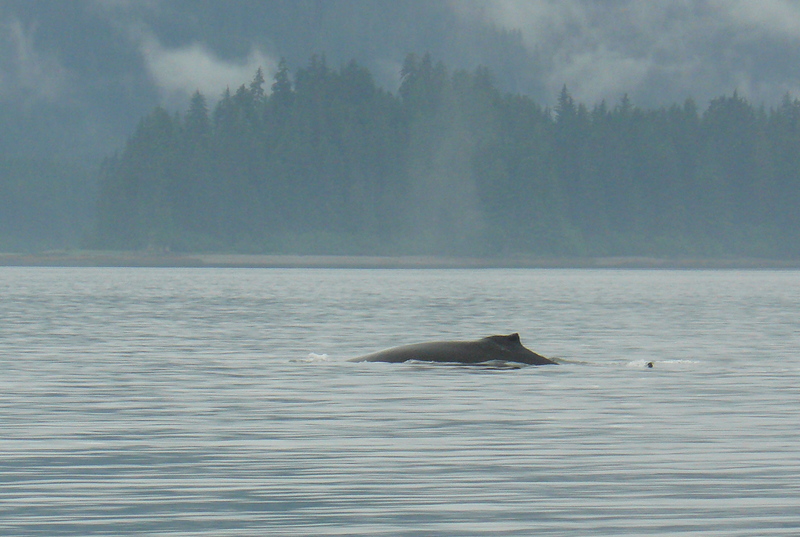 We saw out humpback whale heading up bay he was heading back to Hoonah. We never saw him again. Wanting to pass through a choke point in the bay before the tide turned we paddle without rest. This flooding tide and tail wind gives us a nice push. Waiting would mean fighting waves and current produced by the ebbing tide as it pushed through the choke point. Just past the narrow spot we hear a waterfall and then see where a small stream enters the bay. Here we refill our water jugs and eat lunch washed down with clear stream water. Here also we watch the sun chase off the remaining clouds then sit quietly in the newly delivered warmth. It’s an easy paddle down back to the Eight Bight Cabin where we will stay the night. A cloud of white gulls erupts from a nearby stream as we approach the cabin, telling us that the stream holds spawning salmon and probably brown bears to eat them. After helping to unpack and secure the kayak above the high tide line I put together a fishing rig while the captain heads over to the stream to stretch out on the gravel bank. A yearling Brown Bear suddenly walks out of the brush to disturb his rest. We are downwind so are able to watch the bear from a respectful distance. 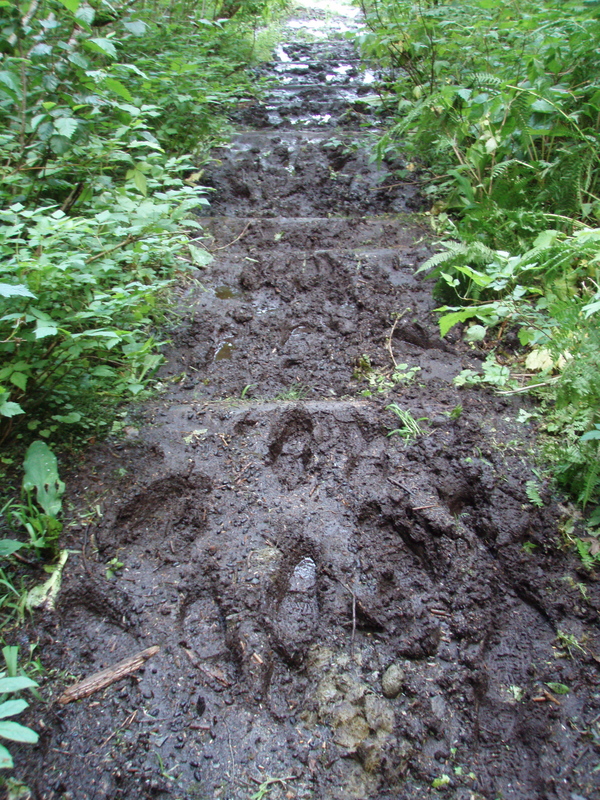 From other bear tracks along the stream we know that other larger bruins are fishing the choice spots of the stream. They must have driven this young one here where deeper waters makes for tougher fishing. 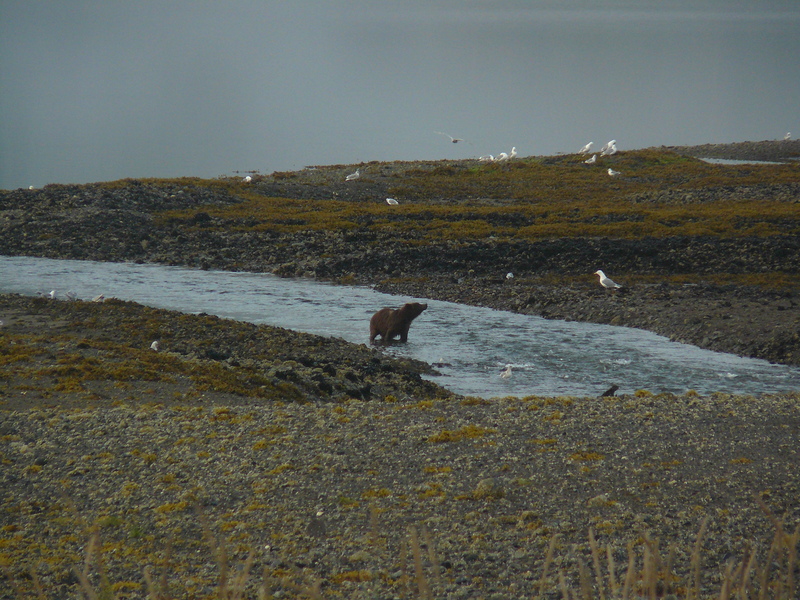 The bear manages to display a wide range of emotion with body language as he tries different methods to dig a pink salmon out of the stream. Sometimes he looks like a playful cat with upraised bum and half submerged face. When that doesn’t work he tries batting a fish out of the water with his strong left paw. Once he looked right at us with his weak eyes. In time the bear forages a meal and we head back to the cabin for ours. 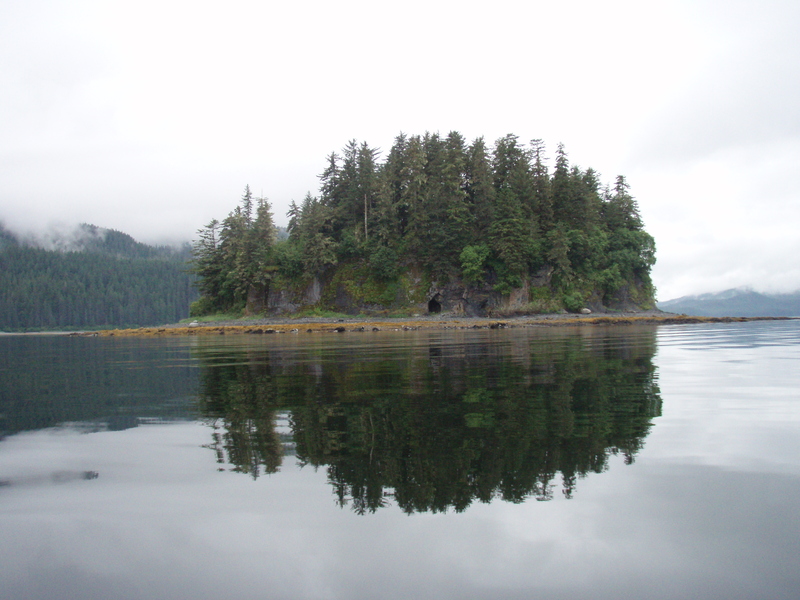 This entry was posted in Brown Bears, Dan Branch, Kayak, Kwethluk, Nature, Southeast Alaska on August 22, 2012 by Dan Branch. Something wakes us early this morning—a complaining eagle or raven, surfacing whale, or just the end to rain. A whale does pass the camp while I’m drinking coffee, which I abandon to watch the big creature make two shallow dives before showing its flukes on a deeper one. With the tide out we can walk all around this fortress like island. Under gray skies invaded by patches of blue I find a natural cave decorated by Bluebells of Scotland flowers as if it were an Irish worship grotto. A different sort of pilgrim today I do a quick sketch and walk back to camp, passing a large round boulder along the way. As out of place as a child’s marble on the rim of flat tide land that rims the island, it could have been dropped by a giant bird or fallen out of a giant’s pocket. 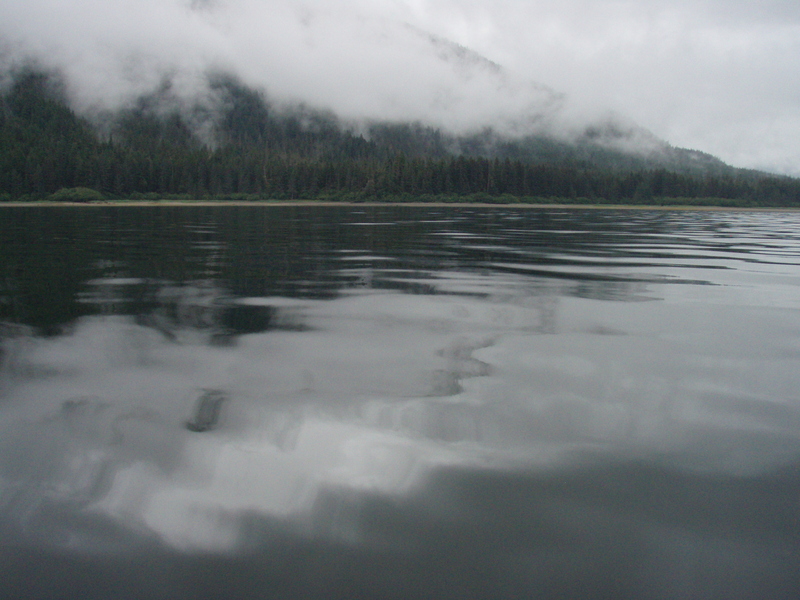 This entry was posted in Dan Branch, Kayak, Nature, Southeast Alaska on August 21, 2012 by Dan Branch. So much work getting ready for a kayak trip! Gear must be assembled and made to fit along with food for a week and clothes into waterproof “dry” bags. My paddling partner and I loaded all in the car, put the kayak atop of it and drove to the Alaska Marine Highway Terminal at 6 am. 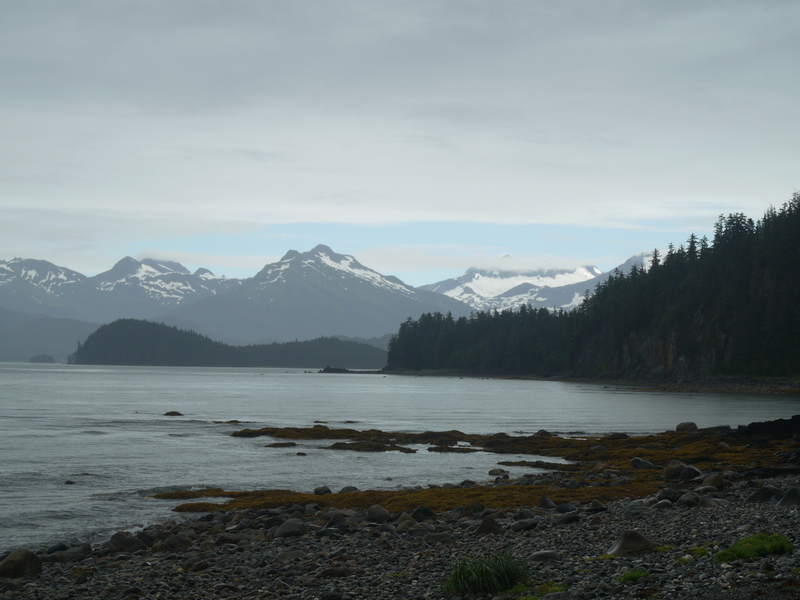 We leave Juneau on the MV Le Conte. 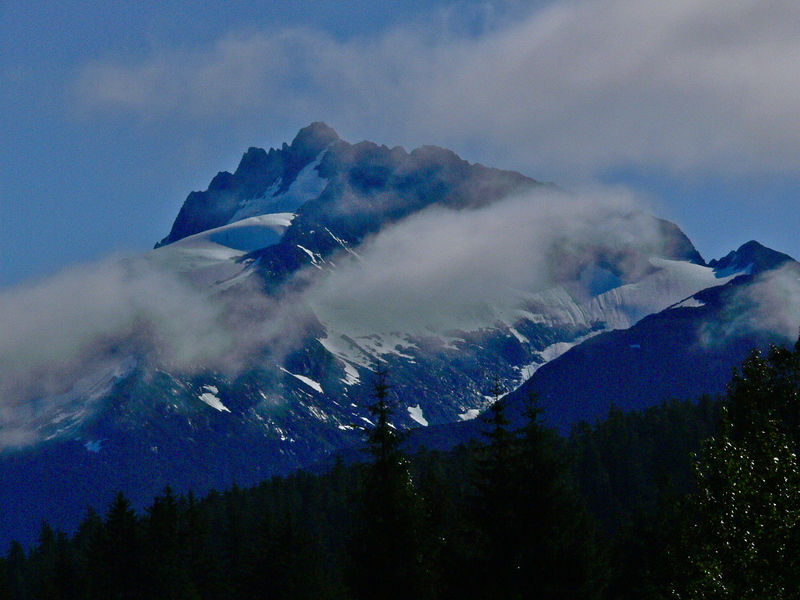 Low clouds obscure the glacier and its surrounding mountains which is just as well. We are too tired to stand on the rainy deck to watch our town slip away. 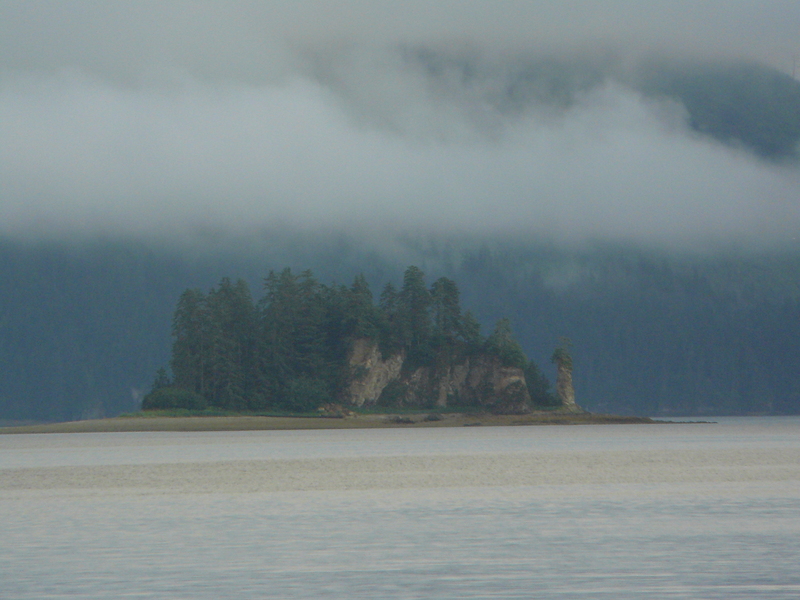 In three hours we reach the Tlinght village of Hoonah on Chichagof Island. There, in a drizzle we carry gear and kayak off the ferry to a rocky path that leads down to the waters of Port Frederick. After filling a used gallon milk jug with water from the terminal we carry everything to the sea and begin to load the kayak as it floats near shore. The sigh like exhale of a humpback whale diverts us from the task and we look up to watch it’s black back rise and then roll as it re submerges. The whale repeats this two more times before throwing its flukes skyward in a silent dive. Good start for the trip. The whale comes and goes from our field of vision as we paddle toward the island where we plan to camp. Rain continues to fall from low clouds that seem to collapses over the green hills lining the shore. At first only golden seaweed lining the shore break the monopoly of grey and green. Then we begin to pass islands of rock worn into provocative shapes like castles and mansions. We stop near one, now stranded from the water by the low tide and eat a sad lunch of dry bread and peanut butter that is soon covered by a film of tiny biting midges (no-seemuns). When spirits flagged a sea creature appears to lighten the mood. Often it is our new friend, the humpback whale swimming along for a bit before diving. Sometimes a pair of Dahl Porpoise streak past us while chasing down homeward bound salmon. The whale puts on a great show just before we reached our island goal. Over and over it throws itself from the water and sends up great splashes on each side of its body as it crashes back into the sea. We began to worry that it might inadvertently crush us with one his exuberant displays. It returns beneath the sea as we round the island and pull out at a suitable spot on its back side. Here no bugs bother us while we set up the tent, cook dinner, and use ropes to suspend the food bags from tree branches to keep them from the reach from the local brown bears. (grizzlies). The rain continues but so do chances to watch animals. Porpoise and the whale hunt for food within 50 meters of camp. Beyond them the waters of Port Frederick offer us passage to the portage where we will have to carry boat and gear over land to a beach on Tenakee Inlet. But that challenge is days away so we settle onto comfortable rocks on the beach to drink after dinner tea and watch the whale roll on his back just off shore. 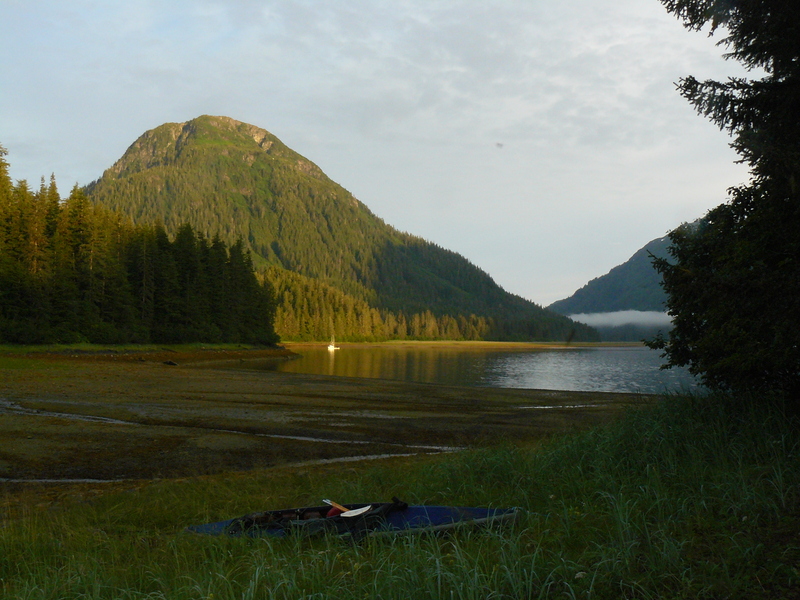 This entry was posted in Dan Branch, Juneau, Kayak, Kwethluk, Nature, Southeast Alaska on August 20, 2012 by Dan Branch. Somewhere the sun shines down on the unworthy — those so spoiled by a warm rich summer that they take blue skies and light for granted. That place may be just over the border in Canada. Even trough my rain spotted glasses I can see a patch of pure blue North above the Juneau ice field. 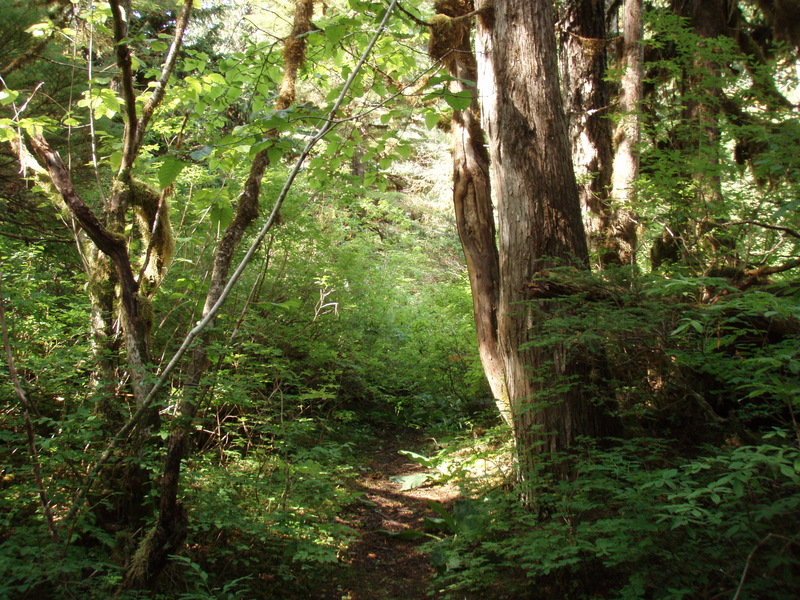 Aki and have returned to this familiar trail through the old growth to tidelands. It’s harvest time in the woods where ripe fruit of red huckleberry and blueberry brush dangle toward the trail. 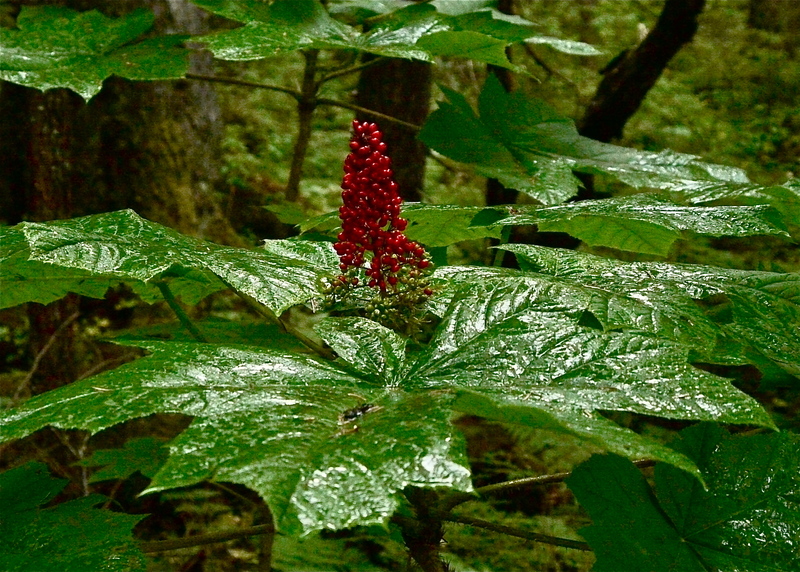 Even the devil’s club sport inverted cones of bright red berries. Some of the thorny plants are turning autumn yellow. We reach the beach just as a raven chases a mature bald eagle from its roost. Job done the self satisfied raven settles in on a near by spruce limb and fills the air with croaks, trills, and disharmonic song. 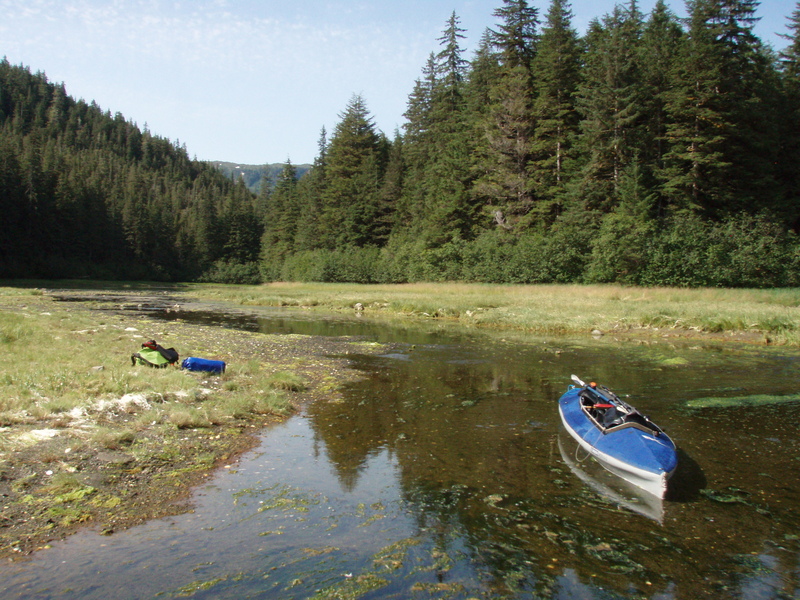 While Aki searches an old campsite for leftovers, I look up Favorite Passage where tomorrow the MV LeConte will take a friend and I to Hoonah for the start of a week long kayak trip to Tenakee Springs. 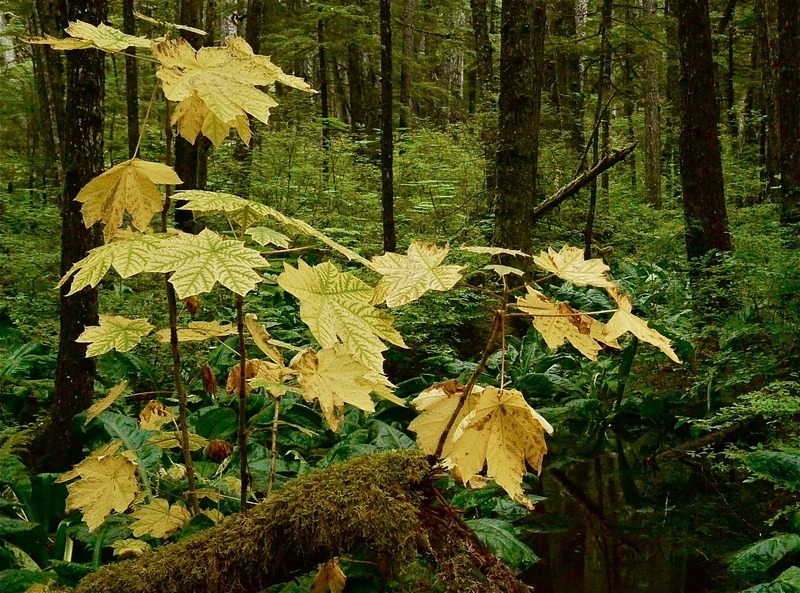 I have hopes for the trip — that the rain will abate, we see untouched groves of the beautiful Yellow Cedar trees, the wind won’t work against the tides, and the brown bears will pass in the peace. I also hope that the tides and wind will carry away the stress of work and getting ready for such a trip. 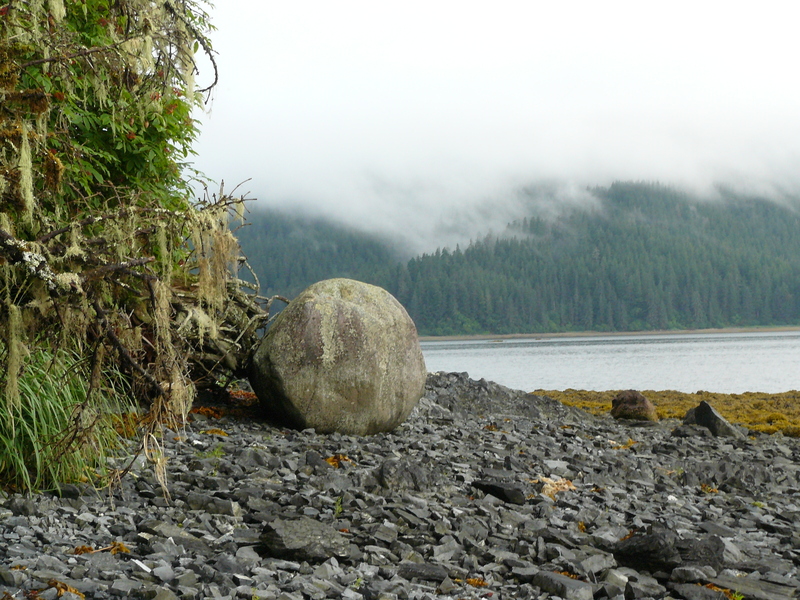 This entry was posted in Aki, Dan Branch, Juneau, Kwethluk, Nature, Southeast Alaska on August 11, 2012 by Dan Branch.